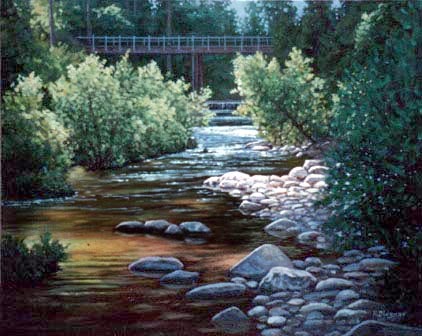 This is the view looking north, upriver, of the San Lorenzo River that my family has enjoyed for the 29 years we have lived here in the Santa Cruz Mountains. My Studio overlooks this stretch of river and this abandoned bridge. In the 1950's it connected via a one lane road to Highway 9, it was still passable, for emergencies, until the storm of '82' washed away most of the road.